Why is little Jon not vaccinated? Does his family not feel welcome at the health clinic, or is the waiting time too long? Do his parents have doubts about vaccine safety, or are they not well-informed about the vaccination schedule? Only when we know the root causes of low coverage can we address them. Despite this, only a few national immunization programmes have conducted in-depth analysis to understand the barriers to vaccination in their countries. The WHO Behavioural Insights Summer School (BISS), jointly organized with the University of Erfurt, Germany and held on 27–31 August 2018, sought to address this gap, offering guidance on how behavioural analyses such as these can be done. Participants built their knowledge on conducting social science studies on the barriers and drivers of vaccination – and learned how this knowledge can be used to develop better-quality health services and strategies enabling and motivating people to vaccinate. Achieving the Sustainable Development Goals (SDGs), including ensuring healthy lives and well-being for all, at all ages, depends on people engaging in recommended health behaviours – such as vaccination. Despite overwhelming evidence that vaccination is one of the most efficient, proven, cost-effective and safe heath interventions, too many people are being left behind or choosing not to vaccinate. Persistent gaps in immunization coverage result in preventable cases of disease and death, as demonstrated this year with the high number of measles cases reported around the WHO European Region. Behavioural insight methods, such as WHO’s tailoring immunization programmes (TIP) approach, can help countries reach and sustain the high immunization coverage needed to achieve the SDGs and other health targets. The BISS curriculum included a detailed introduction to the WHO TIP approach. Immunization programme managers and staff from Albania, China, Estonia, Kyrgyzstan, Latvia, the Philippines, Portugal, Romania, the Russian Federation and Viet Nam, as well as 9 PhD students from 8 countries gained knowledge of behaviour change and behavioural insight theories and methods and how to apply them in practice. Interaction between professionals and academics from different technical fields allowed for practice–theory exchange, peer-to-peer learning and the sharing of experiences and ideas across cultural contexts and disciplines. In addition to the WHO and University of Erfurt organizers, the summer school was facilitated by global behaviour change academics, experts and representatives of the United Nations Children’s Fund (UNICEF), the United States Centers for Disease Control and Prevention (CDC) and WHO headquarters. 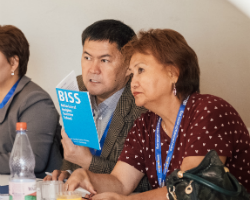 TIP was developed by WHO/Europe to assist health-care professionals, public health authorities and decision-makers in tailoring services to close immunity gaps. The TIP approach has been adapted to other health programme areas and is currently being applied in countries worldwide.